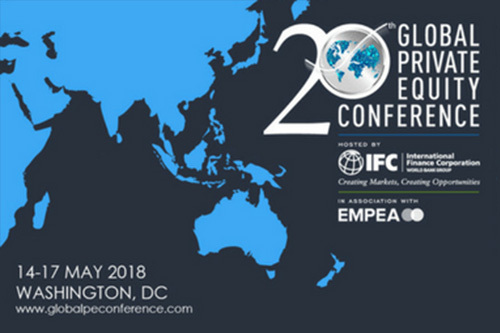 Ramil Muzaffarsky, the Managing Partner of Tethys Investments participated at the 20th Annual Global Private Equity Conference during 15th-16th May 2018 held in Washington, DC. Tethys Investments was one of the few private equity funds from the region participating at the GPEC18. GPEC presented great opportunity for Tethys Investments to showcase its investment strategy, business model and wide-range of investment opportunities in the Eurasia region. 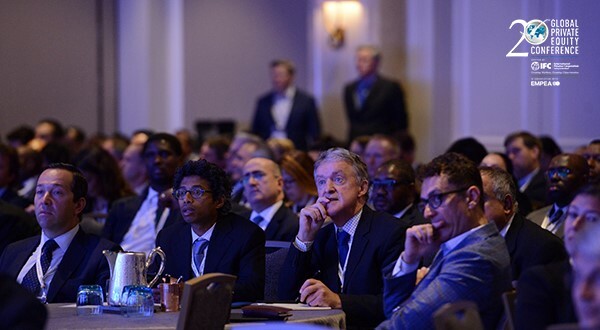 The Global Private Equity Conference is the leading emerging markets private equity event in the world, convening over 850 investment professionals from more than 60 countries. The conference brought a wide array of industry practitioners together—from family offices, private and public pension funds, foundations, endowments, insurance companies, development finance institutions, fund-of-funds, established global fund managers, new investors, international and national government officials and regulators, to private equity consultants and advisors—for thought-provoking discussions, debates and analyses that are most top-of-mind for today’s business and industry leaders. 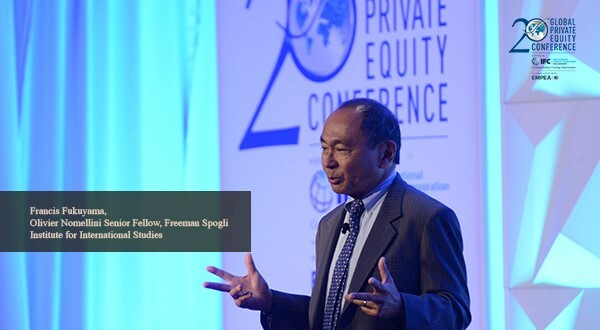 During the 20th Annual Conference in 2018 various topics related to the driving opportunities in private equity and startup ecosystem in emerging markets have been discussed by world leaders, industry leaders and experts including Jim Young Kim, President of the World Bank, Philippe Le Houérou, CEO of IFC, Francis Fukuyama, Resident, FSI Center on Democracy, Development, and the Rule of Law, Stanford University Pascal Lamy, Former Director General, WTO and Former Commissioner, European Commission for Trade, Mo Ibrahim, Founder & Chair of the Mo Ibrahim Foundation, David Rubenstein, Co-Founder & Co-Executive of the Carlyle Group, Maria C. Kozloski, Global Head and Chief Investment Officer, Private Equity Funds, International Finance Corporation (IFC), Ray Washburne, CEO, Overseas Private Investment Corporation (OPIC), Christiane Laibach, Management Board Member, DEG – Deutsche Investitions- und Entwicklungsgesellschaft mbH, Phil Bennett, First Vice-President, European Bank for Reconstruction and Development (EBRD). Ambassador Freeman highlighted that the rule-bound order of the post-World War II era that governed trade and dispute resolution is at risk of disintegrating. Decrying what he called “Troglyonomics,” he noted that processes legitimized by fair procedure have given way to a scenario where “outcomes now legitimate process.” Warning of a “New American animus against multi-lateral institutions," he cautioned that trade managed by governments creates a “politician’s delight” where political risk analysts, lobbyists and those connected to politicians “make out like bandits.” In Ambassador Freeman’s view, those nations valuing free trade may react to U.S. mercantilism with a desire to build institutions (i.e. AIIB, BRICS Bank) that fill the vacuum of the fracturing global order. In a world where the WTO is significantly weakened and massive tariffs are enacted, the basic premise of institutional stability that underlies many emerging market investments cannot be assured. Despite the uncertain environment, Ambassador Freeman suggested that development in emerging markets will nonetheless depend on private capital and the policies designed to attract it. Mr. Le Houérou took the opportunity to discuss the launch of IFC’s "Creating Markets, Creating Opportunities" strategy. He announced IFC’s recently approved $5.5 billion capital increase, which will triple IFC’s paid-in capital. With this additional capital, IFC is targeting an annual investment commitment of $48 billion by 2030. This represents significant growth from last year’s level of $19 billion. Much of the increased activity will specifically target investments in IDA-eligible countries, fragile states and climate-related projects. Over the past year, IFC developed a new strategy emphasizing new financial instruments, “ex ante” impact scoring and a reorganized organizational structure. IFC ultimately aims to help de-risk some of its investments in frontier markets at both the transaction and macro levels. In his view, a world where IFC is more proactive in creating market opportunities also means deepened collaboration within the World Bank Group and with governments, as indicated by a recent example from Zambia where all parties came together to de-risk a solar development project enough to attract capital from private investors. He noted the growing popularity of impact investing, especially among millennials. However, the industry needs to fundamentally agree on the principles and methodology for defining what impact means. As moderator, Ms. Lee highlighted the broad agreement that DFIs need to do more to catalyze private sector capital. Delivering on these increased expectations also means finding more ways to take on and mitigate risk. In Mr. Washburne’s view, OPIC plays a key role in implementing US foreign policy. OPIC has recently focused on SME development and energy financing in Central America and can typically provide long-tenor debt to PE-backed projects. Despite its initial plans to dissolve OPIC, the Trump Administration has significantly reversed course. Pending legislation on DFIs in the US Congress would double the size of OPIC and add new tools like equity authority, which kept OPIC out of many deals with private equity sponsors. Securing passage of the BUILD Act in the Senate is the top priority for the coming year. Ms. von Friedeburg stated that mobilization has always been part of IFC’s DNA. Building on the successful launch of private equity funds managed by AMC, IFC began to think about mobilizing debt in other ways beyond its traditional B-Loan program. Through the Managed Co-Lending Portfolio Program (MCPP), IFC provides credit enhancement to traditional IFC loans to create BBB-rated securities, which mobilizes capital from insurance companies and other major institutional investors. With the IDA18 Replenishment, IFC has access to new financial instruments to blend down government and FX risk for mobilization parties. In his introduction to EBRD, Mr. Bennett noted the organization’s clear commitment to market returns and sound banking. EBRD currently backs over 120 private equity funds, with 55% historically raised by first-time managers. In the frontier markets within its geographic mandate, EBRD is trying to jumpstart an equity culture by doing deals that are structured to provide “exitability.” In his view, succeeding as a DFI is “not about doing more equity but the right equity to build an ecosystem.” Strong returns from EBRD’s direct investments and fund portfolio will close the gap between perceived risk and real risk. Ms. Laibach expressed caution around deploying blended finance instruments. Though the finance gap in emerging markets is large, she saw significantly greater gaps in corporate governance, strategy and management. For strong corporations to emerge in developing countries, business models need to incorporate both favorable returns and development impact. If countries get the policy framework right, strong corporations and investors will ultimately find opportunities to work together. Dr. Kim spoke about the challenge of making capitalism work for everyone on the planet. Technologies like smart phones and broadband internet are rapidly creating “8 billion people with middle class aspirations.” Because official development assistance only represents 7% of capital flows to developing countries today, Dr. Kim suggested that private equity will play a critical role in providing capital and expertise to emerging markets. Though large institutional investors all allocate to private equity today, the industry is still focused on developed markets and Net IRR expectations are now in the 13-15% range vs. 25-30% in PE’s early days. Emerging markets only capture 17% of private equity investment dollars despite accounting for 45-55% of Global GDP. In the early history of private equity in the 1970s and 1980s, Mr. Rubenstein argued that investors focused on getting the highest possible returns while social impact was not a major consideration. Mr. Rubenstein predicted that more private equity capital would enter emerging markets over the next 10 years as the economic climate and growth trends continued to improve. 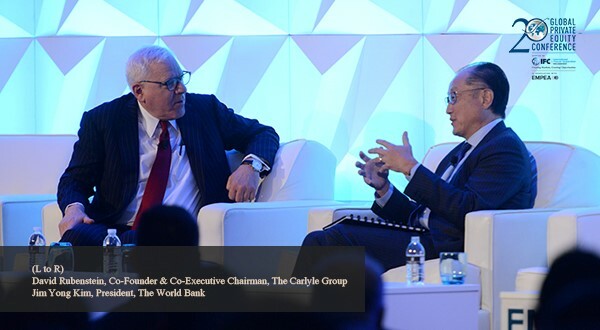 Both Mr. Rubenstein and Dr. Kim agreed that private equity needs to get better at describing what it means by impact and integrating that into discussions of risk and reward. Moreover, any focus on impact investing is not sustainable if it can’t generate reasonable returns. Moderated by Jeff Leonard (Managing Partner, GEF), the panel reflected on the state of the emerging markets private equity industry and some of the fundamental challenges of building a successful firm in the sector. Africa was the last private equity market to develop. Development finance institutions like IFC played a critical role in backing DPI’s first fund. For that reason, Ms. Alam noted that DPI has been focused on ESG and impact measurement from day one. Since DPI aims to grow companies and jobs, its strategy fits well with what DFIs are trying to achieve even as it has attracted more traditional LPs on successive funds. She stressed that PE is a micro-business where investors can withstand volatility by working with companies to target unmet demand and grow market share. Reflecting on how private equity has evolved in India, Ms. Ramnath noted that companies traditionally relied on local capital markets and bank loans for capital. Even though the industry has matured and companies see the value of PE, she believes that investors need an entrepreneurial mentality to successfully operate in India. While flexibility in fund structure and mandate is important, investors should structure portfolio engagement to maximize growth exposure rather than focusing on operational efficiencies as a major source of return. Mr. Rohatyn sees a useful analogy in emerging market debt, which evolved to a significant global asset class from opaque and thinly-traded roots. In his view, EM PE is in the initial stages of a similar evolution. However, EM PE is still struggling to find the right model in some ways. He believes that “funds must be local to find deals but global to exit them.” Large global firms still look at EM PE “as the tail, not the dog” while many single country or region managers need to invest regardless of timing in the cycle or lack the perspective to champion the entire sector. At Mr. Petty’s firm, the structure has evolved significantly and offers clues to how EM PE might evolve more generally. Starting with a single fund and co-invest vehicle, Clearwater initially focused on distressed debt but expanded to the broader EM private credit sector. In his view, establishing permanent capital vehicles is critical for markets like India and China, and as firms become more regional, they should also create separate fund platforms that cater to more specific LP needs. In a sign for how EM PE might evolve, Clearwater recently was acquired by a Canadian asset manager. Since its spin out from CDC 15 years ago, Actis has raised $13 billion from over 200 investors and realized 165 exits. In Mr. Caesar’s view, the key to the firm’s success has been its focused strategy, sector insights generated by local teams and operational excellence. For example, Actis built and exits its own renewables platform in India instead of partnering with an existing company. Mr. Caesar also noted how gravitating to certain sectors like power creates natural currency hedges. The panel discussed the rise of populist movements that risk undoing the global economic policy consensus that has prevailed since the end of World War II. Though the movements come from both the left and the right of the political spectrum, many are skeptical of free trade, reject international rulemaking bodies and support the subordination of monetary policy to domestic goals like job creation. Mr. Naim noted that populism is a tactic for seizing and maintaining power, not an ideology. Moreover, populists who turn to tariffs and quotas are ultimately relying on 19th century tools that are not sustainable given the level of global economic integration. He compared economic nationalism to cholesterol: very few nations can sustain the dislocations of globalization with zero economic nationalism while too much leads to self-destructive policies. The sweet spot protects the social fabric while creating international competitiveness. Mr. Enelamah spoke about the need to incentivize responsible leadership. In his view, there is no purely free market, which means that leaders must be thoughtful in setting economic strategy and collaborating with the private sector. Reflecting on his experiences in government in Nigeria, he believes that the “zone of agreement” is large, and leaders could make meaningful progress in building the right enabling environment if they focused on 80% of the problems and agree on the way forward. In reflecting on why it has been difficult to convince the public of the importance of free trade. Mr. Lamy pointed to the asymmetry between the voices of the losers, who can point to the immediate harm, and those of the winners. This divide has only increased with technological change while traditional safety nets have weakened in the wake of the financial crisis. He agreed that traditional trade protectionism would not address these fundamental societal tensions. Instead, nations should enact domestic policies that address the concerns of globalization’s losers while appreciating the social and culture dimensions in which rapid change is occurring. After 10 years investing in China, Jason Tan, Chief Investment Officer at Jeneration Capital noted that China venture has evolved from a “nice to have” role in LP portfolios to a permanent location for capital. Despite worries about high valuations, Mr. Tan noted that this phenomenon was largely driven by a handful of late stage venture deals that grab headlines. Furthermore, technology business models in China, especially those created by ecosystem companies Alibaba and Tencent, represent what he termed “original species” from a product innovation and user experience perspective. Moreover, in Mr. Tan’s view, the government has taken a permissive view of consolidation and appears willing to accept a small number of dominant technology firms as long as they respect the prevailing political order and do not represent excessive risk to the economy. Investors like Softbank, Alibaba and Tencent have created a surplus of capital targeting the late stage private segment, but their willingness to write such large checks has also shifted the balance of power further towards investors among entrepreneurs who are operating in capital-intensive industries marked by fierce competition. He pointed out several examples of cases where the No. 1 and 2 competitors eventually decided to merge instead of continuing to burn cash in a fight for market share. While investing in China is no longer as simple as letting a rising economic tide life all boats, Mr. Park expressed the view that investors will be catalysts in shifting the country’s growth model into services and the types of consumption that come with rising income levels. BlackRock has already started to invest behind the thesis that consumers coming up the income curve will be able to spend more on health care, education and food. Also, China’s sharing economy “should be top of mind for investors” as it relates to both automobiles and real estate. While it is unclear where equilibrium margins for ride sharing business models will settle, the owners of these companies will have valuable platforms. Touching on protectionism, Mr. Park was optimistic that investors would ultimately adjust and that the rhetoric is ultimately cyclical even if the mood might get more tense in the short-term. Though L Catterton invests across the Asian retail sector, the conversation with Ravi Thakran, Managing Partner & Chairman of L Catterton Asia centered around India. While acknowledging that the Indian economy needs to generate more jobs in the formal economy, he cautioned against over-reading short-term economic data. Mr. Thakran saw fiscal stability driving a climate for relatively sound macro fundamentals. Unlike other Asian countries that currently had what he termed a “subsidized cost of capital,” he viewed India as having a fair cost of capital which forced companies to focus on generating profits and reasonable return on capital. Turning to L Catterton’s focus on the consumer sector, he challenged India to develop more brands focused on the mass market, nothing that luxury was still a niche category. He also cautioned against a “breathless celebration in technology,” noting that traditional retailer still have a role to play even as the environment pressures them to adapt. He viewed the firm’s investment in Fab India as an example of this trend by which L Catterton helped propel an artisanal brand into a modern retail format. Mr. Bishop suggested that despite the recent enthusiasm for impact investing, we should still be asking how far the market will go to reward people who have the intention of solving big challenges. In his view, adopting an impact lens entails getting a much more complete picture on the impact of business activities on society and institutions. At the same time, the impact community still has not reached consensus around how far impact measurement and transparency around them should be taken. In an ideal situation, large institutions would agree on definitions and metrics for impact and disclose them in a way that could be tracked throughout the fund lifecycle. Members of EMPEA's ESG Community engaged the audience in a discussion around the SDGs as a framework for increasing and communicating impact, both for GPs and LPs. While the audience and panelists agreed the SDGs are a useful framework in this regard, the discussion revealed that it is too soon to know whether PE and VC investments lend themselves to a single standard upon which to measure "impact.” Mr. Okun made the case that “impact investing” in private equity must be characterized with clear intention, well-defined objectives and quantifiable results upon which ESG must be the foundation. In this context, the framework of the SDGs can be useful as an approach to investing that is good for business and investors while delivering social impact. The audience was the first to hear the outcomes of the just released report Private Equity's Role in Delivering the SDGs: Current Approaches and Best Practices, which was distributed electronically to delegates on EMPEA thumb drives and via the conference app. The SDG Working Group Members participating on the panel contributed to the report, which analyzes how to approach the SDGs through the lens of private equity in emerging markets. The audience voiced in the panel poll that a toolkit of resources available for impact funds and their investors is most needed to promote impact investing which will best allow funds to raise and deploy capital in this asset class. EMPEA's ESG Community is a step ahead with such a resource, now available to all conference attendees and the global industry. The report offers guidance on how PE stakeholders can integrate the SDGs into strategy and investment decision-making and what challenges PE firms face as they move forward on this agenda—two topics also at the heart of the session’s discussion. The ESG Community is open to all members, and EMPEA will build upon this discussion at the coming EMPEA conference, Sustainable Investing in Emerging Markets, in London on 23 October 2019. Despite concerns about too much capital flowing into private equity, over 80% of the $1.7 trillion in dry powder at the end of last year was dedicated to North America and Europe, leaving a much smaller slice for emerging markets, especially when China is excluded. Ms. Beschloss was very optimistic that more institutional investors would allocate to EM PE in the future, particularly if the high returns of US PE in the last decade do not repeat. She noted a much bigger variation between higher and lower performing managers in EM compared to developed markets. Speaking about Russia, Mr. Calvey noted that sanctions have not prevented the achievement of strong exits in some sectors like fintech and online classifieds. He also highlighted a paradox between Russian bonds and equity. While the bond market prices country’s debt close to that of some European countries, the dispersion in expected equity yields between Russia and those same countries is much larger even for stable assets like infrastructure. Despite any perceived glut of capital, Mr. O’Neill suggested that institutional investors should look at EM PE in terms of how it positions their overall portfolio on the efficient frontier. Within EM PE, he believes that middle market companies will benefit most from attractive secular trends. This suggests the importance of backing managers who are close to the local market and deeply engage with companies during the diligence phase. While Mr. Moukahhal spoke optimistically about institutional investors allocating more capital to EM PE, he noted that the sector is competing with both developed markets PE and public markets PE in the minds of some LPs. He suggested that managers have flexible fund mandates to consider transaction structures like PIPEs. He views his firm’s home region of MENA as resilient against geopolitical shocks and highlighted the rise of e-commerce companies like Souq, whose sale to Amazon indicates the growing spending power in the region. Lenna Koszarny (Founding Partner & CEO, Horizon Capital), Carlos Martins (Partner, Vinci Partners), Seymur Tari (Founder and CEO, Turkven), David Snow (Moderator, Founder & CEO Privcap). In this panel, three private equity leaders shared their experiences exiting portfolio companies via IPO. Though EM companies list on a wide range of exchanges, successful ones have a demonstrated a track record of EBITDA growth and possess management teams who are comfortable operating in the public spotlight. Mr. Tari recounted several key lessons from two IPOs (Dominos master franchisee in London and fashion retailer Mavi) that ended up being in the top three Turkish private equity exits based on return multiple. Noting that investors want to see EBITDA growth at inflation plus 15-20%, he also touched on the importance of the issue size with $200 million being the minimum size necessary to attract high quality institutional investors that will anchor the order book. Dual listings should only be pursued if the float is large enough to support liquid trading volume in each market. Also, in the case of Turkey, a track record of successful local listings can help firms source investments from families who want to achieve liquidity but retain control of the board through a minority shareholding. Mr. Martins shared his experiences with two specific IPO processes. In late 2017, Burger King Brazil priced at the top of its expected price range, with 80% of investors coming from outside Brazil. Though Vinci Partners only sold 40% of its shareholding, Mr. Martins suggested four quarters of solid growth often made it easier for PE investors to exit their remaining stake via a block sale or follow-on offering. He noted that BRL 200 million ($60 million) is probably the minimum EBITDA size for a viable IPO, but even a company of that size would likely attract local investors only. The decision to pull back from a public listing of Unidas, a car rental company, also reflected the importance of timing. When a competitor went ahead with its IPO and accepted a substantial discount, Vinci Partners chose to wait and eventually sold the business to another competitor at a valuation in line with its original price expectations. Emerging markets venture capital is getting considerable attention from LPs with funds raised and capital invested having tripled in the past five years. In this panel, the participants discussed the strategies of their respective firms and how the sector can better address the pain points of entrepreneurs. The rapid growth of companies like M-Pesa has been a significant catalyst for the development of the VC ecosystem in Africa according to Ms. Ribica. With over 450 incubators now on the continent and teams that often include a mix of diaspora and locally-educated co-founders, African start-ups can create business models that leapfrog established companies in a range of sectors like health care, agriculture and logistics. With its focus on growth capital, AfricInvest has identified a gap in financing for firms that are past the seed and Series A stages. Moreover, often firms reach $5–10 million in revenue, investors can add significant value by helping founders overcome the talent shortages that often exist at the next level of management. With its focus on southeastern Europe, Mr. Sertoglu sees a massive dislocation between the quality of talent in the region and the level of capital that the region attracts from LPs. He stressed that many still focus on China and India when discussing EM VC as a category. Earlybird is a first-time fund that seeks to back companies that can quickly evolve into global players. He noted that thanks to the relative lack of capital, VC investors like Earlybird can get favorable terms and do not need to rely on a handful of massive outcomes to generate strong returns for the entire fund. As a Partner at 3TS Capital, Mr. Totia views its 31 active portfolio companies as either “local leaders” that can expand across central and eastern Europe before exiting to a regional consolidator or “global challenger” that can compete in more mature technology markets and attract US-based acquirers. Like others on the panel, he noted that the region was underserved by venture capital despite the presence of entrepreneurs who can build companies to early revenue milestones ($3-5 million is the firm’s sweet spot) and manage their business according to sophisticated financial metrics. He also stressed the importance of entrepreneurs building relationships with potential acquirers several years ahead of planned exits and noted that many revenue-based partnerships evolve into exits. Mr. Karthik represented a market where VC has attracted significant LP interest. In pointing out the large consumer market and high-quality talent pool, he also noted that VC has been present in India long enough to start generating liquidity for LPs, which attracts further investor interest. Corporate VCs like Tencent and Alibaba are increasingly targeting the Indian market, and large corporates are validating major themes like e-commerce, as Walmart recently did with its acquisition of Flipkart. While there are several unicorns in India, venture investors still experience loss ratios as high as 30% of their portfolio and cannot depend entirely on one or two stars for the fund to reach a 3-5x overall return. Reviews of the GPEC 2018 were kindly provided by the EMPEA.